MACOMB, IL – Today it was announced by Google that the Illinois Institute for Rural Affairs (IIRA) at Western Illinois University was named a winner of the Google Impact Challenge. The IIRA was recognized as one of 10 non-profit organizations in the state of Illinois with the most innovative projects in creating economic opportunity. More than 170 proposals were submitted. The winning project from IIRA assists small towns in opening grocery stores so that residents gain access to fresh produce and meats. As one of the Google winners, the IIRA will receive $75,000 and training from the Google team to jumpstart its ideas. And as one of this year's Google Impact Challenge winners, the IIRA at WIU now has the opportunity to receive an additional $250,000 from Google for the People's Choice Award, which is given to the project that receives the most public votes. 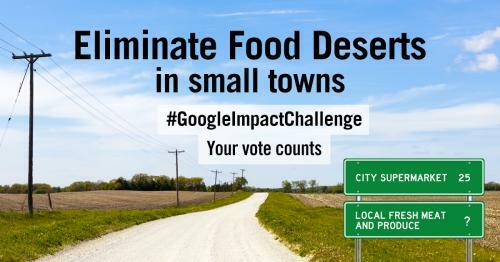 Beginning today (Thursday, Feb. 7) through 11:59 p.m. Thursday, Feb. 14, WIU students, faculty, staff, alumni, friends, community members and others from across the globe can move Western to the number one slot in the Google Impact Challenge by casting votes at g.co/illinoischallenge. Individuals can vote once during the contest. According to IIRA Director Chris Merrett, the funding received from the Google Impact Challenge -- both the initial $75,000 seed money, and hopefully, the $250,000 grand prize -- will provide economic opportunity, and access to fresh food, for rural towns in Illinois that are without a grocery store, as well as a market for local farmers and their locally produced goods. "This project creates community-owned grocery stores that employ three to 10 people per store, while also growing local farms, in places that are referred to as 'rural food deserts," Merrett explained. "We follow a cooperative model that allows for faster start-up, smaller local investments and community engagement. The Winchester, Illinois store, Great Scott! Community Market, is the IIRA's community-owned store prototype. It currently has one full-time employee and four part-time employees. Sales, which were estimated at $270,000 annually, are on track," said Sean Park, IIRA faculty assistant, who oversees the IIRA's Value Added Sustainable Development Center. Park also owned and managed a grocery store in a small town for 10 years. 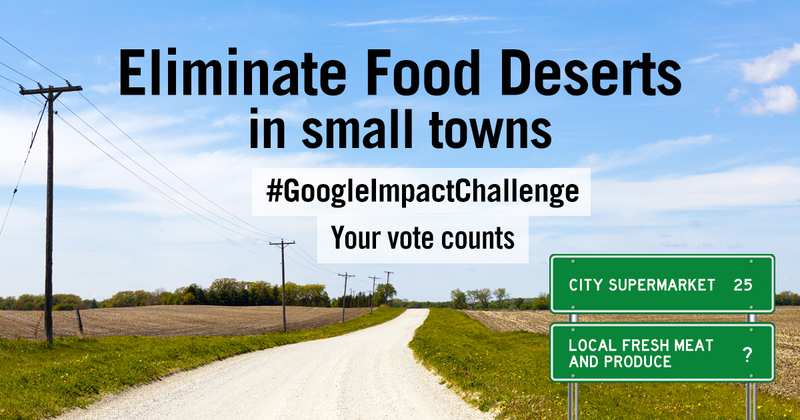 "With additional funding from the Google Impact Challenge, should we win the People's Choice Award, we can assist with opening six to eight stores in rural Illinois communities over a two-year period," Park added. This could mean up to eight full-time positions and 24 part-time positions, and up to $2.1 million in annual sales. "While we can't estimate the figures, we do know that fresh food grocery options in rural communities increase residents' health through the availability of fresh food, a decrease in emissions and an increase in the local economy," said John Gruidl, IIRA professor emeritus, who returned to work for the project. Gruidl has extensive experience in entrepreneurship in rural regions. "The project improves the quality of life in rural Illinois." Park explained that the model allows for a quick start-up - nine months to one year and a small capital investment of approximately $100,000 for a 1,500-square-foot store. The Great Scott! Market in Winchester opened in August 2018. As the Google Impact Challenge is aptly named, the proposals submitted for the challenge must demonstrate how the project will make an impact. "In Kansas, more than 20 percent of small grocery stores have closed since 2007, and nearly two-thirds of rural grocery store owners in Minnesota plan to leave the business in 10 years. In Illinois, similar statistics aren't available, but the IIRA receives a call almost weekly from a community losing its grocery store. The issue affects tens of thousands and is a drain on local economies," Merrett explained. "The loss of a grocery store leaves residents without nearby access to fresh nutritious food. And each closing results in 10-40 employees without work. We are driven by the institute's mission to improve the quality of life in rural towns." The team looked at current rural grocery store models, as well as traditional food cooperative models, before moving forward with the initial project in Winchester. They found that traditional grocery store models aren't financially feasible, and the typical food coop models typically focus on providing specialty foods, such as organic, non-GMO, etc. and can take three to seven years and up to $4 million to open. The IIRA model combines the best of entrepreneurial business approaches with cooperative ideals, Merrett added. "Our business models drastically reduce start-up, overhead and noncompetitive inventory, while using cooperative fundraising and management techniques to build community ownership," he said. "The model is easily adaptable to a community's needs, and furthermore, under this model, goods are purchased from local farmers to keep the investment local." In addition to the six to eight communities that could initially benefit from the IIRA project through the Google Impact Challenge People's Choice Award grant funding, other communities throughout the state will be able to replicate the model. "We have a broad network of organizations that will support this model," Merrett added. "There's the possibility that this model can spread to other states through our relationships with national co-op educators and many others. Our model serves to build rural economies, increase social benefits in rural areas and to improve lives. We're in the business of making a difference." For more information on the IIRA and the Value Added Sustainable Development program, visit iira.org, or email IIRA@wiu.edu.